In a recent post I described the dog-friendly hotels and tavernas in the area of Polirizos, below Rodakino village (4/8/2013). While we were there we explored the nearby beaches, which were easier to visit with Sage than the beach at Polirizos (less people, more space etc), and would be perfect for free-camping with your dog. From the western end of Polirizos a dirt road continues on round to Peristeres beach. Alternatively, you can take the short footpath up over the rocks. This path needs a bit of scrambling at the end, but the views from the top are breathtaking. The beach seems endless and deserted, with brilliantly blue, cool sea, a few tamarisk trees, and small, wooded mountains sheltering it from behind. On our first afternoon there, we went exploring up over the rocks. 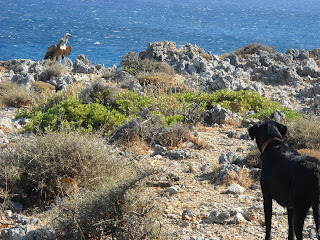 It was a nice, discrete place to let Sage pee away from tavernas and beaches. The path is short, but quite lovely - full of trees, goats, thyme... we saw a vulture too, a huge bird with massive wing-span, really majestic. Luckily Sage was not tempted to chase it. 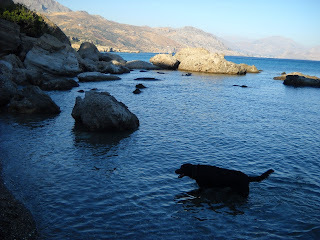 There were a few people on Peristeres Beach, but walking five minutes further down from the small cantina at the start of the beach, there was nobody and we could let Sage off the lead to run around and have a swim. The cantina was great too, really relaxed with simple but good food, fantastic views, nice music, reasonable prices. There were a few families there, and a couple had brought their dogs with them too. We kept Sage on her lead there, mostly because I don't like her begging from other tables and causing a nuisance. We stayed there until it was almost dark, then hurried back over the rocks to Polirizos. Again, we had to keep her on her lead for some of the way, until we got past the curious goats who wouldn't get out of our way (well, it's their home I suppose). 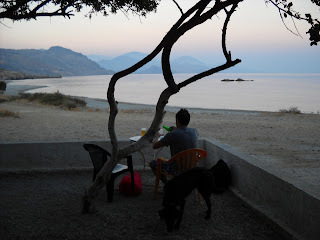 On the second day, after a lazy morning at Polirizos sheltering from the heat, we walked round to Peristeres Beach via the dirt road. This way is definitely easier, but does take longer, and no vultures. 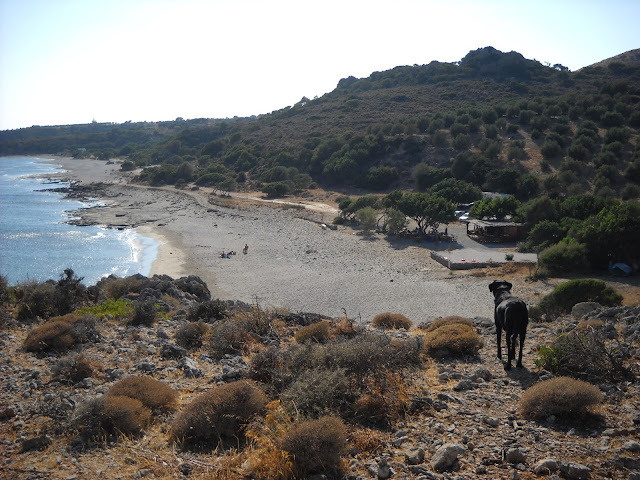 We walked all the way along the beach until we came to Agia Marina Beach, which is perhaps even more deserted, unspoilt, and perfect than Peristeres. 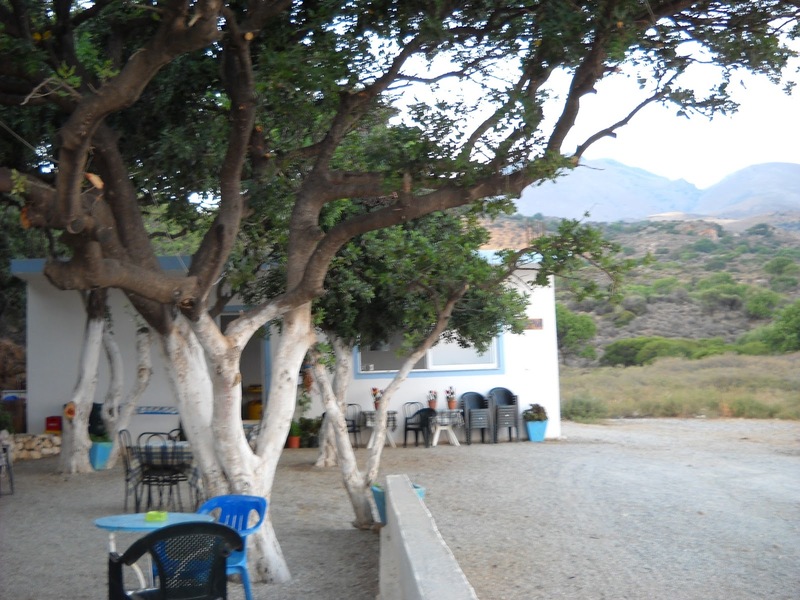 It takes its name from the small church of Agia Marina, tucked away in the tamarisk trees just off the beach. water typical of the south coast of Crete. There are several areas where the tamarisk trees have created little shelters, right on the beach, just the right size to protect a tent. There are also large rocks to use as shelter from the sun or wind. The dirt road continues on as far as the church, then winds on up inland. We continued right to the end of the beach, and found a small cove to swim at. Here the track ends with a fence and we didn't explore any further round. On the second evening, I wanted to stay for an evening swim at Agia Marina. As the sun is going down, the rocks glow a really vivid orange colour, and the sea turns pinky-purple. It faces the wrong direction for dramatic sunsets, but you don't need one - the changing colours of the scenery there are truly spectacular. 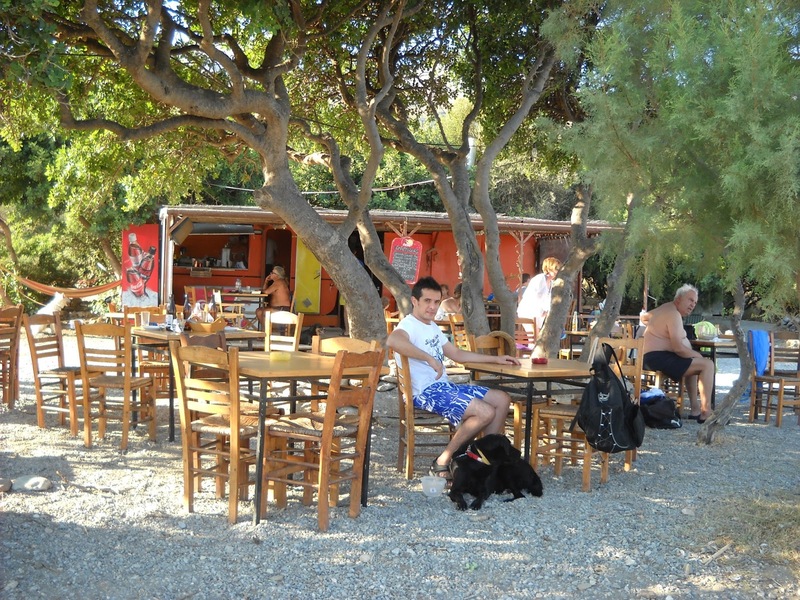 We stopped at the small taverna hidden away right at the end of Peristeres Beach (towards Agia Marina) - the Taverna tou Drakou. I loved this place. It was so small and sleepy, with a really nice hushed atmosphere. They served a limited menu, but the food was really good. They were very welcoming to Sage, and there was another family who came in to dine with their dog. who likes to sit and relax with a drink, or something to eat, and to be surrounded by mountains and sea, and very little else. The owner was very hospitable, to us and to Sage, and tried to give us her torch when we left, to find our way back in the dark. We managed to find the way back along the road easily enough anyway. 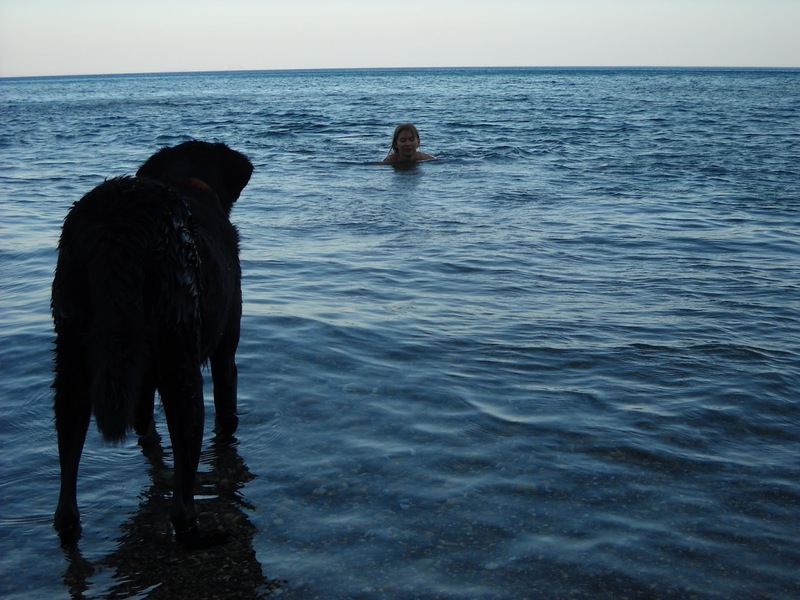 The day we left for Heraklion, we made a quick stop for a swim at Korakas Beach, to the east of Polirizos. This beach is more organised, with umbrellas and sun loungers. On this particular day, the wind had picked up, so there were not many people there. However, with so many beautiful beaches to go with your dog to in this area, Korakas is probably not the easiest option. even just sitting on the beach, quite unpleasant. I also feel obliged to say that free-camping is not permitted on most Cretan beaches, and I have heard reports that this year they are being quite strict about this.... 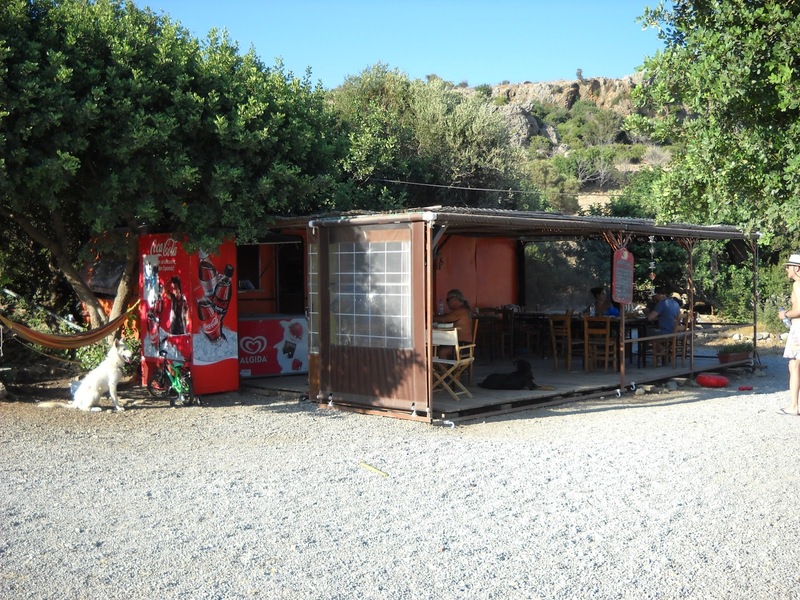 If you are not inclined to risk a windy night in a tent, or a potential run in with the authorities, there are many lovely dog-friendly rent rooms and hotels in the area that you can use as a base, to discover this beautiful area (see post 4/8/2013).